Chef Mani Niall brings the story of nature's oldest sweetener to life, serving us food history and honey lore mixed with more than 100 delicious recipes to inspire and delight. How do you know the type of honey to select from all those bottles at the farmers' market or on the store shelf? Are all honeys created equal? 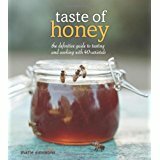 What makes one varietal of honey taste different from another? Which is best for baking and which is best for cooking a savory dish? Why is one darker than another and what does that mean? All these questions and more are answered in Taste of Honey. Veteran cookbook author Marie Simmons helps you understand the life of a bee, and how its habitat influences both the color and flavor of the honey it produces. Then she explains how these flavor profiles are best paired with certain ingredients in over sixty simple, delicious recipes that range from breakfast and side dishes to main dishes and desserts. Plus, every recipe notes the ideal type of honey to use in it.